The nation of Colombia is misunderstood and has worked hard to change its global image. As is the case with most nations, money can always be generated through areas of narcotics and corruption. This is the face that most people have seen from Colombia. What makes these recent events so amazing is that the LaRed principles that began in Bogotá in 1989 have now reached many of the Colombian Institutions as well. 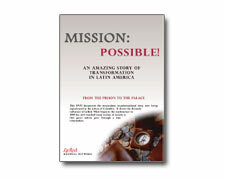 This is a transformational story of large scale training with INPEC, the Colombian prison system. This form of institutional training has now been embraced in other nations and has literally moved from the prisons of Colombia into the palaces of Guatemala, Uganda and Mexico.